Lee Hardy was hard at work days before Easter. No, she wasn’t prepping her Easter Sunday menu, but she was doing something she loves: making hundreds of baskets to give away to kids in her Florida neighborhood. Hardy, who receives the empty baskets from the Manatee Fire Department, purchases the items with which she stuffs them. And every year, she increases her basket goal. 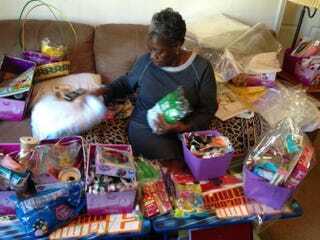 On Good Friday, hundreds of kids gathered at her home to pick out their baskets. Next year, there may be at least 1,000 kids seeking baskets. "I will have about 700 in here, but 1,000 is my goal," Hardy told WTSP. "One year, I'm going to do that 1,000. "I just think of joy and love," Hardy said.